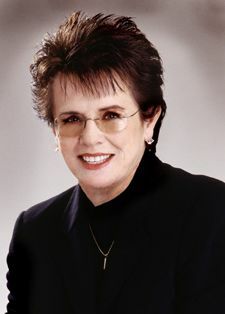 Sports legend and social pioneer Billie Jean King will be the keynote speaker at the Phoenix Women's Sports Association's (PWSA) Fourth Annual Girls and Women in Sports Awards Dinner on May 19, 2007 at the Arizona Biltmore Resort. King, one of the most illustrious and celebrated tennis players in history, is recognized for spearheading the women's movement in tennis and for her life-long struggle for equality in sports and in life. King empowered women and educated men when she defeated Bobby Riggs in one of the greatest moments in sports history – the Battle of the Sexes in 1973. In 1990, Life magazine named her one of the "100 Most Important Americans of the 20th Century." In 1994, she ranked No. 5 on Sports Illustrated’s “Top 40 Athletes” list for significantly altering or elevating sports the last four decades. King, who resides in New York and Chicago, has been heralded as an ardent defender of equal rights for all humankind. She founded the Women's Tennis Association and the Women’s Sports Foundation in 1974 to advance the lives of girls and women through sports and physical activity. In 1998, King became the first athlete to receive the prestigious Elizabeth Blackwell Award, which is given by Hobart and William Smith College to a woman whose life exemplifies outstanding service to humanity. In February 1999 King won the Arthur Ashe Award for Courage for her fight to bring equality to women's sports. Off the court, King remains active in a number of important causes. She serves as a director on several boards including the Women’s Sports Foundation and the Elton John AIDS Foundation. Although her place in tennis has certainly been secured as one of the all-time greats, King remains active in the sport she loves. She co-founded World TeamTennis in 1974 and remains active in both the WTT Professional League and WTT Recreational League. King, who has coached Olympic and Fed Cup teams, led the U.S. squad to four Olympic medals and the 1976, 1996, 1999 and 2000 Fed Cup titles. In 2003 she received two of the tennis world’s highest honors. King was awarded the prestigious Philippe Chatrier Award, the International Tennis Federation’s highest honor, recognizing individuals for contributions to tennis and was one of six inaugural inductees into the Court of Champions at the USTA National Tennis Center. King’s biggest honor in tennis came on August 28, 2006, when the National Tennis Center, home of the US Open, was renamed the USTA Billie Jean King National Tennis Center, in honor of King’s contributions to tennis, sports and society both on and off the court. Less than two months later, on October 17, 2006, King was honored once again when the National Sports Museum and the Women’s Sports Foundation announced that the Billie Jean King International Women’s Sports Center, the nation’s first permanent, comprehensive museum dedicated to women’s sports, will be housed at the National Sports Museum when it opens in New York City in 2008. King is the only woman to win U.S. Open singles titles on all four surfaces on which it has been played (grass, clay, carpet, hard.) She’s also one of only eight women to hold singles titles in each of the Grand Slam events. King has had a long and impressive career of firsts. In 1970, King was one of nine players who broke away from the tennis establishment and accepted $1 contracts from tennis promoter Gladys Heldman in Houston. The revolt lead to the formation of the Virginia Slims Tour and Women’s Tennis Association. In 1971, she was the first woman athlete to win more than $100,000 in any sport. In 1974 she became the first woman to coach a professional team with men when she served as player/coach for the Philadelphia Freedoms of World TeamTennis. She is a member of the International Tennis Hall of Fame and the National Women's Hall of Fame. She is the founder of the Women's Tennis Association and the Women's Sports Foundation. The only awards celebration of its kind in Arizona, the PWSA Awards Dinner recognizes outstanding female athletes and coaches at the high school, community college and university levels, as well as the community and corporate leaders who support them and outstanding journalists who cover girls’ and women’s sports. For tickets and more information on the dinner, visit phoenixwomenssports.org.